My office is in the basement immediately under the master bedroom. This could be problematic when combined with my 5am starts because of our thin floors and my wife enjoying her sleep, but is actually perfect because I prefer to create in silence. It doubles as the guest room but that’s not a thing because my wife and I are both introverted so we don’t often seek out houseguests to fill it. My two daughters, 5 and 3, have pretty much claimed the guest bed as their own, anyhow: sometimes they giggle their way down the stairs and knock me off my chair with hugs, then jump on the bed to play and forget I exist. No sound makes me happier than listening to our two tiny humans narrating the new worlds they’ve made. I rarely close the door any more. It’s my space. I get to create there. My family lets me go down there to try and put words together in interesting ways and encourages me to keep doing so. I’m so spoiled. Small toys. I’ve discovered I have a weakness for buying them. If I sell a story, I treat myself. Lego. Star Wars. Realistic die-cast models. They line the window ledge and give me something to look at other than books and desk stuff. And photos. I layer them. I hate getting rid of old ones, so new shots of the kids and my wife and my family get put in front of the old. I figure I have about ten years before the layers reach the edge and I have to do something so the new pictures don’t fall off. I have carpets, too. A small Persian Baluch under the bookshelf and a large Afghan Turkmen between the desk and the door. They are miracles of craft and care. If you knew how soft and finely woven and beautiful they are, you’d wish, like I do, that everyone could have their own. Because, after all, bare feet. There go I but for the grace of God? Gently controlled chaos? Best laid plans for tidiness falling to pieces as often and easily as my plot and character outlines? I’m actually very pleased with myself with how clear my desk is in the picture, given that I’m just starting the final chapter of my next novel’s first draft. Usually by this point I can’t see any desk surface at all, and am becoming seriously worried about all the things I’ve lost and might never see again. But right now I can sit at the desk and just work, without my peripheral vision taking in all the mess and stressing me out. 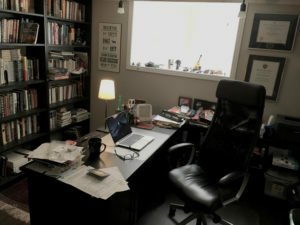 Advice I’d give a younger me: less clutter is good for the creative soul. Also, the scientific evidence for this is far from certain, but I’m convinced that, in winter, 30 lit minutes from the small SAD lamp on the desk will lift me up. I love the idea that it can force more light into me.